Marketing helps you to deliver a responsive, flexible high-quality, professional childcare service which meets local demand. In an increasingly competitive early years sector, marketing helps you to better understand, anticipate and satisfy your customer needs. It also helps you to find and attract new customers, which improves your long-term sustainability. By constantly reviewing and asking key customers what they like (or dislike) about your service, you can improve and add new offers’ to make your service even more attractive. This improves your position and makes you more interesting or attractive to local families. Conducting regular surveys or asking for parent feedback about any aspect of your service helps you to shape your service and respond to need. Parents and local families are key customer groups for early years providers as well as funders, partners, employees, supporters and volunteers. In fact, anyone who benefits from, uses or supports your service is a customer. Each customer group has different motivations and expectations. Using market research as a tool to profile or better understand the characteristics of each customer group is a great way to review and improve your offer to them. How should we market ourselves? You may wish to develop a marketing plan to identify your intended customers, and decide how best to target them with a marketing message. There are many marketing opportunities available to you. You can organise special events such as open days or celebrations; launch digital promotions; take up paid (or free) online or print advertising; set-up web links with parent-friendly sites such as your local Family Information Service; pay for entries on childcare search engines; find ways to undertake mutually beneficial partnership working. Fundraising is a great way to your boost income in a difficult economic climate. While it’s never a good idea to rely on fundraising to cover your basic running costs, most early years providers work to very tight budgets. Raising extra funds can help buy additional or special equipment or resources for children, or allow you to offer reduced rates for families in financial difficulties. Local companies or businesses like to support projects which benefit the community and enhance quality of life locally. As childcare providers play a huge part in their local community, a setting asking for fundraising support to create a lovely outdoor play area, for example, could be an attractive fundraising proposition. You can also benefit from direct fundraising support from parents and others who like, use or appreciate your service. Parents are generally happy to raise funds for their child's setting and there are lots of creative ways to get them involved, such as participation in sponsored walks, organising seasonal fairs or running stalls at local community events. Be aware that to run lotteries and raffles you will need to contact your local authority who are responsible for ensuring that small lotteries meet the required regulations. 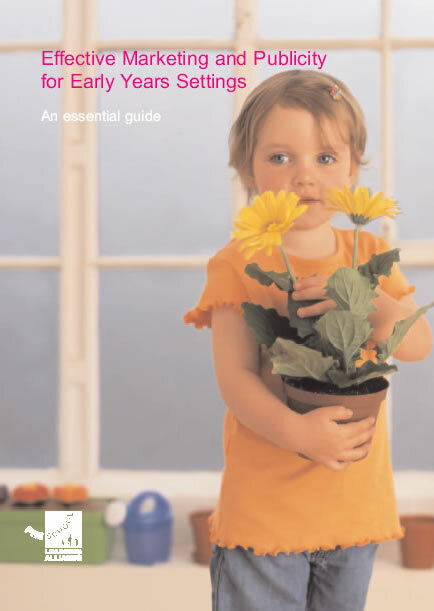 Further guidance on improving the long-term success and sustainability of your setting through regular marketing and publicity can be found in Alliance publication Effective Marketing and Publicity for Early Years Settings. Website Development and Design gives guidance on the various steps involved in developing a website for your setting, including content and design which are important when considering your marketing strategy. Your setting can raise money every time your parents, staff or supporters shop online with major retailers such as Amazon and Marks & Spencer. Just register your setting with easyfundraising and let everyone know. Every online purchase generates a donation to the chosen childcare group – at no cost to the customer or the setting. "Our new nursery service was great but very hard to find. We developed a simple marketing plan and publicised our official opening day celebration everywhere - over 50 families came along. We always find ways to shout about what we do - now everyone knows where we are!"